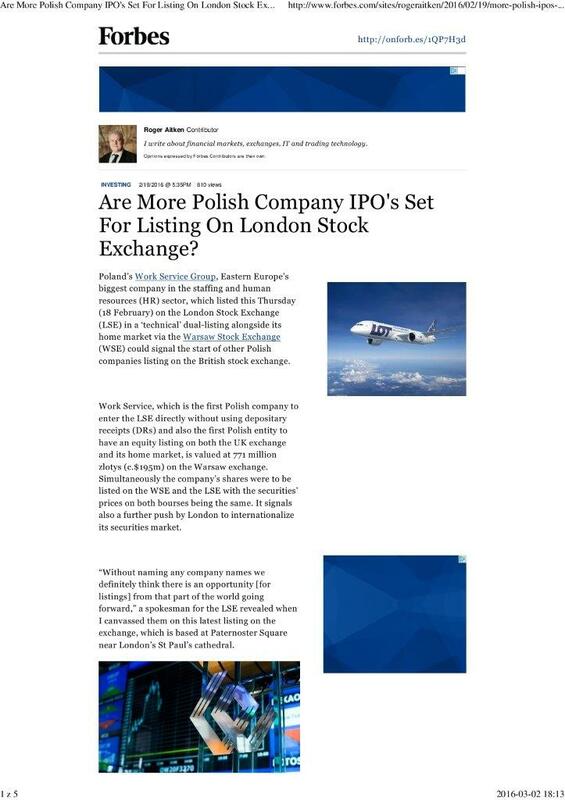 FORBES: Are More Polish Company IPO’s Set For Listing On London Stock Exchange? Poland’s Work Service Group, Eastern Europe’s biggest company in the staffing and human resources (HR) sector, which listed this Thursday (18 February) on the London Stock Exchange (LSE) in a ‘technical’ dual-listing alongside its home market via the Warsaw Stock Exchange (WSE) could signal the start of other Polish companies listing on the British stock exchange. Work Service, which is the first Polish company to enter the LSE directly without using depositary receipts (DRs) and also the first Polish entity to have an equity listing on both the UK exchange and its home market, is valued at 771 million zlotys (c.$195m) on the Warsaw exchange. Simultaneously the company’s shares were to be listed on the WSE and the LSE with the securities’ prices on both bourses being the same. It signals also a further push by London to internationalize its securities market. “Without naming any company names we definitely think there is an opportunity [for listings] from that part of the world going forward,” a spokesman for the LSE revealed when I canvassed them on this latest listing on the exchange, which is based at Paternoster Square near London’s St Paul’s cathedral. Still, one could view this latest Polish dual-IPO listing as potentially auguring well for future Polish listings on the London market. Companies listed to date in both Warsaw and London include New World R-A SH (mining), Exillon Energy (oil & gas), International Personal Finance (financial services), Plaza Centers (real-estate investment & services), Prairie Mining (mining), UniCredit SpA (bank), Banco Santander SA (Bank) and MOL Hungarian Oil & Gas. The latter through a Global Depository Receipts (GDR) issuance program. There are also five companies listed on the LSE’s markets, but with primary business in Poland. These include Stock Spirits Group Plc (beverages and spirits) on the exchange’s Main Market, Bank Pekao SA (Main Market via a GDR), as well as three listings on the fledgling and smaller cap Alternative Investment Market (AIM) – 3LEGs Resources Plc and San Leon Energy Plc, both being classified as oil and gas producers, aswell as DP Poland Plc in the travel and leisure space. Interestingly, Work Service Group’s listing solution, which was developed by the ProPrimo consultancy and implemented in collaboration with Kochanski Zieba i Partnerzy law firm with offices in Warsaw, Kraków and Lublin, comes just a couple of weeks (4 February) after a prestigious event and panel debate sponsored by the Polish embassy with business and industry leaders from the UK and Poland at the House of Commons in London’s Westminster – in Committee Room (No.14). This room, for those that don’t know, is where the committee of the 1922 Group of Tory MPs no less meets and have discussed Britain’s continued membership of the European Union (EU). The spectre of a possible British exit (aka ‘Brexit’) was even raised by one British Tory MP, Daniel Kawczynski, who attended and wrapped up proceedings. His comments over the UK’s EU membership were haunting the corridors after delegates left the room. In such salubrious surroundings within the confines of the Palace of Westminster, a wide-ranging discussion and Q&A was hosted by Tory MP Matthew Offord and moderated by Filip Slipaczek, a London-based ‘triple-chartered’ financial adviser. We even heard from the Polish ambassador to the UK, HE Witold Sobków, who gave an insightful keynote address on the long-standing historical links between the two countries over the centuries. It’s also not every day one meets a ‘tipped’ Mercury Music Prize nominee, with award-winning musician Katy Carr who this November released her latest album ‘Polonia’, which has in the past month been rated as one of the top three albums by MOJO magazine in their ‘MOJO Rising’ section. Expanding Work Service’s Investor Base Turning back and focussing more directly on Work Service’s IPO, it is being touted as reflecting its efforts to “broaden its investor base” and strengthen its position and assist its expansion into new markets. Potential acquisitions and moving into new territories are certainly on the cards going forward according to Adam Jenkins, Work Services Group’s Investor Relations point man, who also heads up the firm’s international operations. It should also do no harm in raising their brand recognition and provide access to an enlarged group of investors globally. Growth In Poland’s HR Services Market In 2014, the entire human resources (HR) services industry in Poland generated a turnover of PLN2,788m zloty (c.$710m), which represented a double-digit percentage (22%) increase compared to 2013. So, financially pretty positive and healthy. And, in 2015 the company entered the permanent recruitment services market in Germany and Hungary, implemented a strategy for recruiting and contracting IT professionals in countries such as the Czech Republic, Slovakia, Hungary, Germany and Switzerland, and developed its cross-border recruitment activities. Jenkins has reveals too that their intention is to achieve a ‘Top 5’ status in Europe in their sector over the next 3-5 years. Clearly, a presence in London should go some way to achieving that goal. That said, were to a ‘Brexit’ to happen it could throw a spanner in the works – at least in the British HR market. But time will tell. Operational since 1999, the company is not only the largest provider of comprehensive HR services in the Polish market across the country via a network of branches, but also in 11 other European countries (Belgium, Czech Republic, France, Germany, Turkey, Romania, Hungary, Russia, Slovakia, Switzerland and the UK). With their speciality areas including personnel consulting services plus HR restructuring, recruitment and staff outsourcing, already to date over 3,000 companies have selected Work Service as their business partner. And, each year around 300,000 workers find employment via the companies belonging to the group. Maciej Witucki, President of Work Service’s management board, commenting on the firm’s IPO development said: “We are convinced that our presence on the LSE will help us strengthen our position as a regional industry leader and ultimately enter the top five of HR service providers in Europe.” It might give some of the big HR players in the space a run for their money. Shares in Work Service Group were trading at around £2.10 (c.$3.00) a pop in London this Friday in thin trade. It’s early days in their listing debut for sure. But it might be a stock worth considering for exposure to the Polish market and HR sector as well as the CEE region more generally over the medium to longer term. Kochanski Zieba & Partners has advised Redefine Properties Limited on the largest transaction in the history of the commercial property market in Poland – the value of the transaction exceeded 1.1 bln EUR.